Great, and really useful plugin! having a lot of issues getting my site verified with google analytics – I have it working for google webmaster tools. I have tried placing the code in the header, including it in a php file, and simply inserting the tracking code provided to be by google analytics into your plugin’s setting in wordpress. Any help you can provide is GREATLY appreciated! Hi Kayce – can you share your blog URL? I thought this plugin generated sitemaps, am I misunderstanding its purpose? When does it generate a sitemap? Plugin version available on WordPress Repository doesn’t generate Sitemap. Is this going to be updated soon to support WordPress core v3.9? Yes. Just pushed latest version. in the real time – which again isn’t populating the GA reports. Sorry if I’m missing something, but please help! I *think* I have figured out the issue. AIOW switched to the universal GA tagging. And using your old UA number and just adding your domain does NOT work. You have to create a whole new GA property that is specific for universal analytics, use that new info, and then AIOW will work. I had to get a separate plugin for the classic analytics to be recognized. App Shah, please correct me if I’ve overlooked the ability to have both classic and universal in AIOW…i’d rather not have a whole separate plugin. grrr now adding google analytics isnt working…. What problem are you seeing Tiffany? Fatal error: Call to undefined function crunchify_xml_sitemap_create() in /home4/ting3/public_html/wp-content/plugins/all-in-one-webmaster-premium/all-in-one-webmaster-premium.php on line 382 this is what i get when i try to update a page in worpress!!!! Can you please make sure that your site’s root directory has write access? 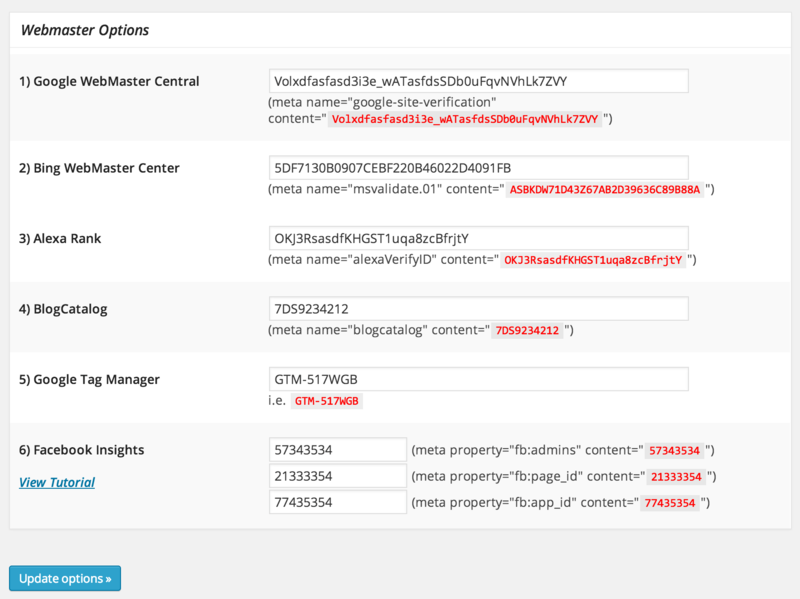 This may cause when plugin doesn’t have enough permission create sitemap.xml file. Sorry for trouble. I found a bug in code. I got other two reports too. I’m going to release new version by end of today. Please stay tuned. I have just updated AIOW Premium to v10.2 which fixes “Fatal error: Call to undefined function crunchify_xml_sitemap_create()”. This is must upgrade release. Please do let me know if you still see any other problem. Hello. From yesterday, the Manual HTML Header / Footer section is missing. Do you plan to include it again? I am a active user of this plugin and the new change is negatively affecting. Hi! We just implemented All in One Webmaster today to http://blog.schedulebase.com/. After it was implemented I noticed ” /> in the upper left corner of the screen. It looks like the plugin form has an extra ” /> after the Google Analytics field. Is that why “/> is showing up on upper left corner of our blog? How can “/> be removed from our website? Thanks for sharing screenshot. This is because you have wrong value in text box. Remove meta name= from field and just add the “content” part. i.e. value similar to you see in red color. I am getting no KWs reporting in Google Analytics (from AdWords) and the AdWords rep says it’s the snippet. We’re using All In One Webmaster…. and when I try to remove the snippet (to put manually in the head), it’s not shown in the form any more. How can I delete it? I didn’t get your question clearly. Not sure which part you want to delete and from where? From Admin panel (header / footer section)?Can you please share your blog URL? mtell . com is the URL. I’m trying to remove the snippet via the ‘analytics options’ tab of All in One Webmaster Options. Thanks Dan for quick reply. Can you please try upgrading plugin? New version has universal tracking enabled. Kindly look at attached image..
this is a google analytics question/problem. Everything was working fine until your last update. the blogs i updated to the latest version all lost their google analytics data. I’m getting nothing on them now. Is this because we now have to add the site name in addition to the tracking number for google analytics to work. I guess so. 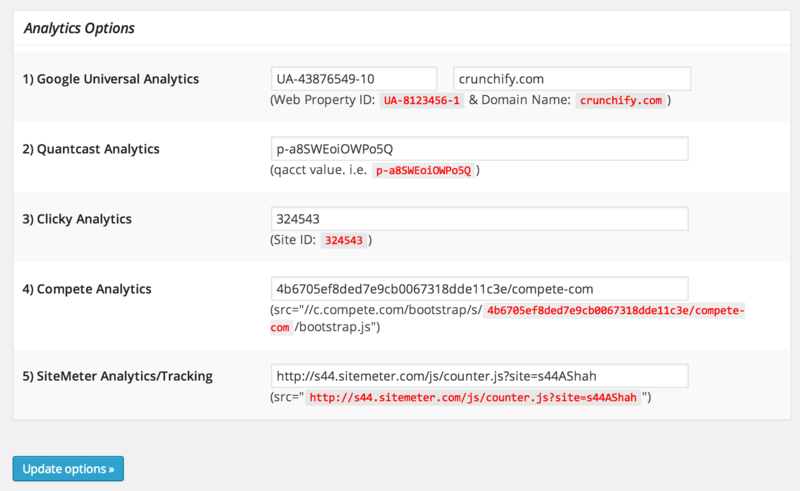 Please visit this link for detailed info: https://crunchify.com/google-analytics-universal-tracking-now-in-all-in-one-webmaster-wordpress-plugin/. This is a new Universal Tracking introduced by Google. It will report better analytics for your blog. It will be one time change but we have to do it. When I added the UA code to 3 of my blogs all of them stopped getting google analytics data. The blogs I did not update to 8.2.6 are all getting analytics fine. Now I’ve had to paste the analytics java code into my header section for those 3 blogs and I am getting analytics data again. So something in the 8.2.6 update is not working for me in terms of google analytics. Maybe I’m the only one. I don’t know. You should see something like below in your blog’s Head Section. Find attached image. I had tried all those steps in your link but in the interest of research I will go back on one of the blogs and try it again and let you know if it works and what I see in the header. As I mentioned the work around I came up with had the analytics data working again. I did a new blog from scratch and it seems to be working fine. it could be that those other blogs were set up with classic analytics and maybe that’s why it didn’t work for them. Currently this plugins adds analytics tracking code to your site. 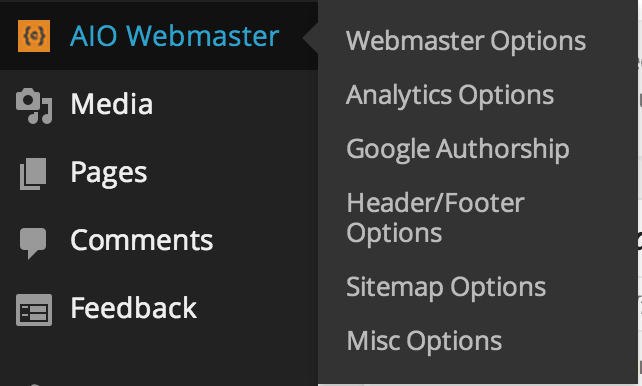 There are more than 10 different tracking and webmaster options available for you to add from option panel. If you have the Google xml sitemap plugin set to send notifications to google and bing, is it advisable to have all in one webmaster do the same? Yeah sure. There isn’t any harm pinging the same multiple times. Awesome. New update 8.2 looks great. Do you have any other service are you planning to add? There are couple of services I’m planning to add in next release. Do you have any service in mind? I updated this plugin yesterday, and now my analytics are showing NO search engines as a source. I normally only get 15 to 20, but I’ve never gotten none. I’m looking at Google Analytics and at the WordPress Jetpack Analytics. Thanks for posting your comment. I’m not sure what you mean? Can you point me to your blog and will check included java script into head of your blog. Same thing happened on my site. The latest post did not appear in Chrome or IE10. When I deactivated the plugin and refreshed the cache, the latest post appeared. I would like to fix your problem Stephen. Can you please try activating plugin and refreshing cache again? Might be cache issue. Thanks Luca for sending out screenshot. I didn’t hear any more complaint with new release. I’ll spend some time to debug it probably tomorrow and let you know. Meanwhile can you please try re-installing plugin again? Fixed! It was a problem with jquery and the theme.